Before you fire up this year’s viewing of It’s a Wonderful Life, make a quick batch of Lasso the Moon cookies for snacking. These crescent moon cookies are completed with a chocolate lasso. Vegan. 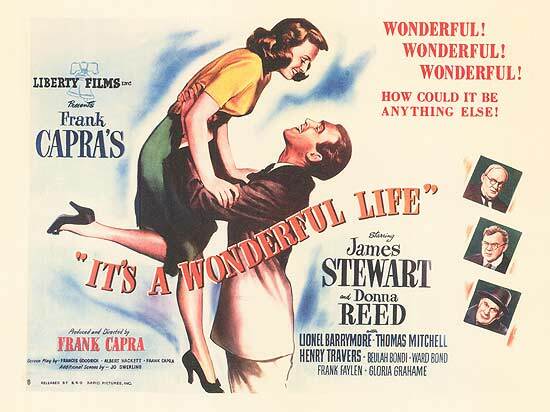 It’s a Wonderful Life turns 70 this year. The classic holiday movie follows the life of George Bailey, a man who never left his little town and feels like a failure. While contemplating suicide, his guardian angel, Clarence, shows up to show George what his town would be like if he’d never been born. George is able to see glimpses of an alternate universe where his good deeds went undone because George wasn’t there. And (spoilers) when George returns to his real life again, he’s able to appreciate anew what a wonderful life he’s really had. David and I send out Christmas cards every year. And as much as I love a good stationery store, around the holidays we usually do something more personalized. The card is a parody of one of the well-known movie posters for the film. Of course, Avon and Jezebel needed to be included too. Avon was billed as Clarence, the guardian angel second class, who is still trying to earn his wings. And Jezebel was cast as Mr. Potter, George’s nemesis and local curmudgeon. In the film, when George is able to return to his timeline, he knows he’s home again when he reaches into his pocket and finds his daughter Zuzu’s flower petals, that he’d hidden there earlier in the film. So inside the card, I tucked a few petals inside of each one. At one point in the film, before George and Mary were married, George was flirting with her. Mary makes a wish, and George tries to squeeze it out of her. He wonders if maybe her wish was for the moon. I can’t make any promises about moonbeams where your nails used to be, but today I lassoed the moon for you. These sweet little cookies would make a great treat for Christmas movie watching, to snack on with coffee while playing holiday music, or as a little gift for the It’s a Wonderful Life movie lover in your life. Crescent moon cookies are classics like It’s a Wonderful Life. Mine are vegan, of course, and made with both all-purpose and almond flour, and a touch of almond extract. The buttery light cookies have a slightly salty edge that marries perfectly with a dusting of powdered sugar and a chocolate lasso. Then pipe the melted chocolate onto parchment paper with a pastry bag or freezer bag that has a hole cut in the corner. Draw simple lasso shapes (basically a loopy 6). Then let them solidify in the refrigerator for at least 10 minutes. These delicate moon cookies have a slight crunch to them and a nutty edge by way of the almond flour. The chocolate completes the experience perfectly. Not overly sugary, they have just a kiss of sweetness. I hope that you are having a very happy holiday season, however you celebrate. Best wishes to you and yours! These adorable vegan cookies are based on a line from It's a Wonderful Life when George offers to lasso the moon for his future wife. They are light and buttery with a dusting of powdered sugar and a chocolate lasso wrapped around them. Makes 10 or 11 cookies. Line three baking sheets with parchment paper. Set aside. Put the baking sheets with lassos into the refrigerator for at least 10 minutes, so that the chocolate can solidify. In a small bowl, use a fork to fully combine all purpose flour, almond flour, and coarse sea salt. In a large mixing bowl, combine almond extract, evaporated cane juice, and non-dairy butter. Use a mixer to whip it for 30 seconds to a minute, until light and fully combined. Slowly add the flour mixture to the mixing bowl, continue beating a minute or two, until well combined. Use your hands to form the dough into a ball. Put the dough ball on a plate, and move to the refrigerator for 10 minutes to chill. Once fully chilled, remove the dough from the refrigerator. Pinch off pieces that are about the size of a rounded teaspoon. Roll each piece into a 1 1/2 to 2 inch long log, slightly pinch the ends, and bend into the shape of a crescent moon. Put each moon shape onto the final parchment paper covered baking sheet. Continue with each moon, spacing each one out about 2 inches apart. Bake for 12 minutes. The edges of the cookies will be slightly toasty brown. Either move the cookies to a cooling rack or carefully pull the parchment paper wth the cookies on it off the baking sheet and onto the counter to cool. Allow the cookies to cool completely before putting the chocolate lasso on them. Otherwise, the chocolate will melt. Once the cookies are cool, dust them with powdered sugar, and wrap each one with a chocolate lasso. *You'll likely have more chocolate lassos than needed for the amount of cookies. However, I offer a larger amount since lasso sizes and chocolate width can vary by person. Plus, if any lassos break or don't fit, you'll have extras for back-up. Yay! I’m so glad to hear it. Thanks, Kristina! These cookies are beautiful, Cadry! What a cool idea. I’m not sure which is cuter – your Christmas card or these cookies! Both are so much fun! Thanks, Dianne! I hope you had a wonderful holiday. Y’all are so stinkin’ cute. Those holiday cards!! OMG. LOVE THEM. And the cookies are just adorable. Thanks, Bianca! I hope you had a great Christmas! You are so cute I can barely cope! Those cards, perfection. I love this movie, and watch it every year. Did not know that it was its 70 years this year, how wonderful! Yes, the timing worked out beautifully! When we were making the cards & cookies, I had no idea that it was a significant anniversary for the show. How fortuitous! And thanks for the kind words, Susan! Cad, I’m sorry I was clueless about the rose petals. Even though I didn’t catch on right away, I thought they were a very nice addition to an adorable card! I enjoyed reading this post, and now everything makes even more sense to me! I love these so much! I’ve said it before, and I’ll say it again. You and David are SO creative! Love seeing what you come up with! Aw, you’re the sweetest. Thanks, Sarah! Miss Kitty as Mr. Potter!? PURRFECT! 🙂 Also those cookies look delicious! Hope you’re enjoying your holidays! Haha! Yes, she’s our sweet little curmudgeon. 😀 The holidays have been a delight. I hope you’re enjoying them too!